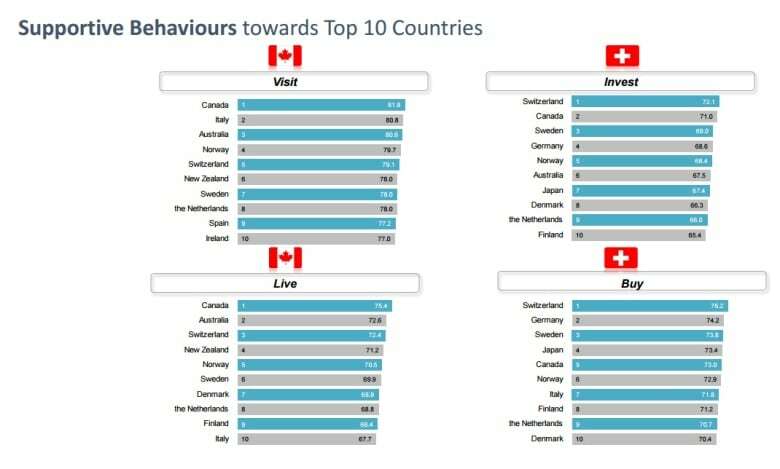 For the fourth time in six years, Canada has come out on top in a survey that tries to determine which country has the best reputation — not that we're the types to brag about it. 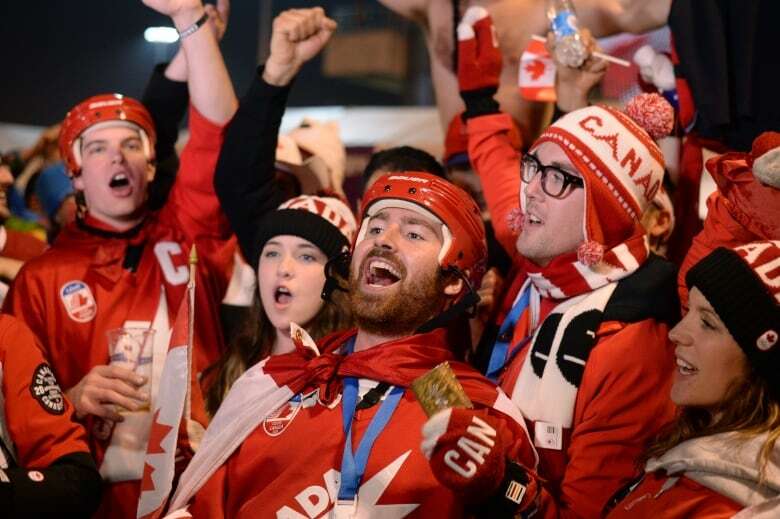 The world's perception of Canadians as "friendly and welcoming" people helped us reclaim our No. 1 spot this year on the Reputation Institute's annual ranking of countries by perceived image. 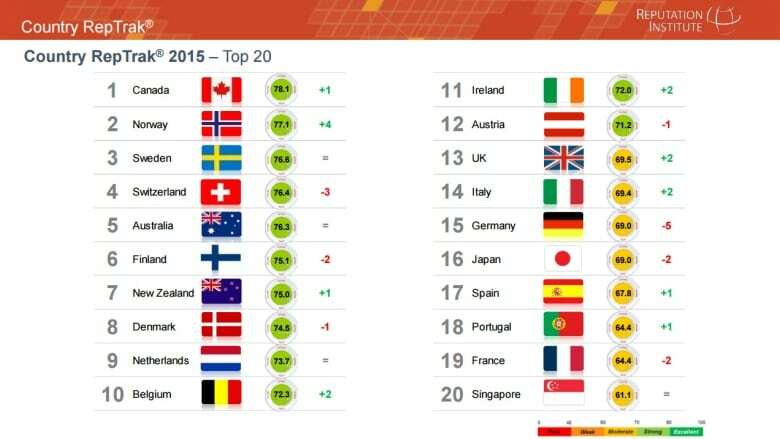 In 2014, Canada came in second to Switzerland, as it did to Sweden in 2010. 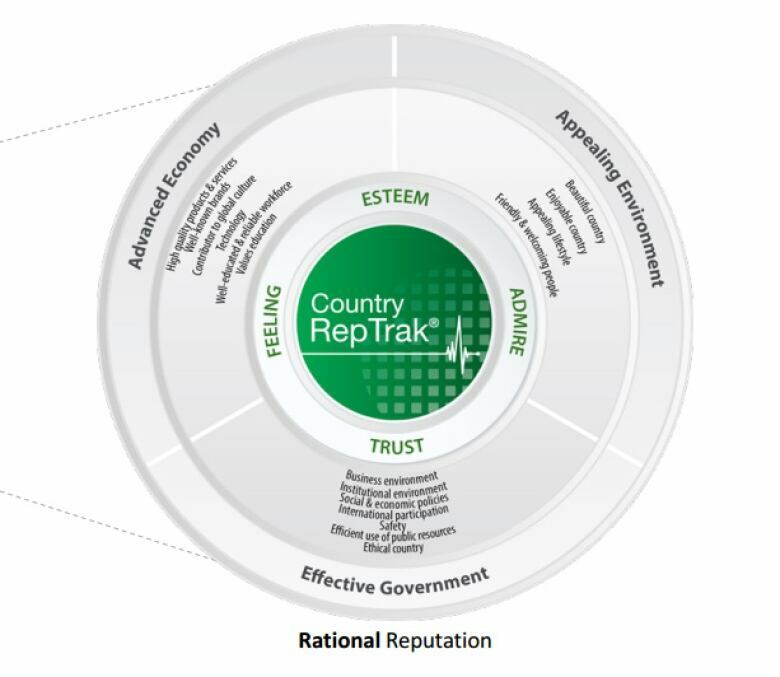 That said, we've been at the top of every other reputation list compiled by the global research and advisory firm since it started releasing its annual Country RepTrak report six years ago. "[Canada is] consistently seen as a great place to live and it wasn't affected significantly by the recession," said the Reptuation Institute's head of research, Brad Hecht, to Forbes this week following the 2015 report's release. "It's also perceived as a good place for tourism." To find out how the 55 countries with the highest GDPs stacked up against one another in terms of reputation this year, the institute surveyed more than 48,000 people living in G8 countries between February and March using online interviews. An additional 30,000 people from non-G8 countries with large economies, such as India, China, and Brazil, were also interviewed to gain more data. The 20 countries with the best reputations, as determined by the survey, were unveiled in a comprehensive report available on the institute's website called The World's View on Countries: An Online Study of the Reputation of 55 Countries. Along with some interesting analysis on how and why the list shaped up as it did, the report explains what respondents were asked about in order to compile its reputation ranking. Along with questions about the perceived physical beauty, available experiences and institutional organization of different countries, respondents were also asked which countries they admired, which gave them a "good feeling" and which they themselves would like to interact with. Interestingly, on a scale of how residents of a country felt about their own reputation versus how others saw it, Canadians were among the most self-critical. Russia, on the other hand, had an incredibly positive view of itself despite having the fourth worst reputation out of all 55 countries on the list. While many online, like Canadian Finance Minister Joe Oliver, are publicly celebrating the results of this year's survey, others are debating its accuracy and wondering how well Canada's reputation reflects the reality of living in this country. Nearly 800 people have commented on a Reddit post about the report since it was posted there Wednesday. "Absence of corruption had me laugh out loud," said one commenter in response to a chart showing the level of perceived public sector corruption in Canada as relatively low. "It is a great day for Canada, and therefore the world," said another, making one of many South Park references found in the thread, to which another Redditor replied "Ah yes, the Duke and Dutchess of Calgary are here. As are the little mushroom people of Nova Scotia!" Others both on Reddit and elsewhere online were simply proud to see the country they call home being recognized in a positive way. "I am not exaggerating: I thank my lucky stars every single day for being born in Canada," reads one comment with more than 100 upvotes. "Canada has lots of flaws. But on the most important things, we are very strong. I truly love my country."